A highlight of each year is definitely the Melbourne Spring Fashion Week. Not many fashion festivals around the world open their doors to the general public but the Melbourne Spring Fashion Week is one of the biggest fashion festivals that does just that. It's also one of my favourite events because it's run by the City Of Melbourne and it offers a huge range of volunteer positions of which I have applied for 2012. 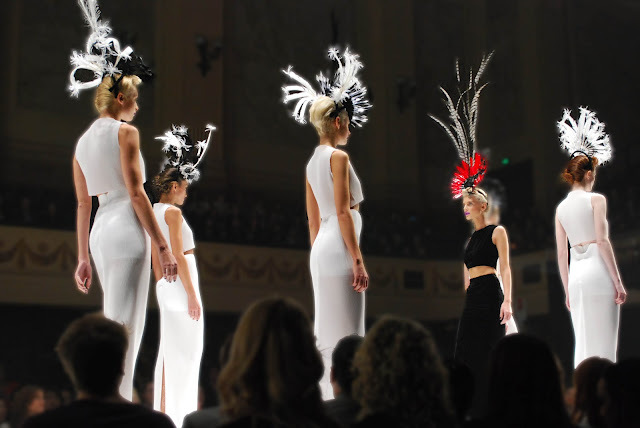 In 2011 I volunteered and did mostly promo work which lead me to getting 2 free tickets to my first ever runway show (pictured) that featured designers like Nicolangela, Richard Nyon Millinery and Yeojin Bae. We were so close to the front and I had such a blast taking photos of all the dresses I would buy if I were a millionaire (or at least had a job). I also had my first (and hopefully last) experience of working backstage at a Saba runway show dressing models. To most this may seem like an exciting thing to do, and don't get me wrong, I love Saba, but I really didn't enjoy it and I'm hoping that this year I'll get to do front of house and get to see heaps of shows for free. I had a fantastic experience and met a lot of people who I still talk to now and have their own blog. Check out Oh, That Boy. Expect a post later in the year about the 2012 Melbourne Spring Fashion Week and hopefully I get an awesome volunteer position and heaps of free stuff.